The last article in the ‘Analyse A Real PPC Campaign’ looked at a website called FindMeAGift.co.uk, who had created both an effective pay per click search advert and landing page to maximise the number of conversions they get through PPC for the holiday season. In this article, I thought it would be a good idea to look at a campaign from a highly recognised brand: Ted Baker. To scare off competition – Some campaigns bid on their own brand name so that other advertisers known not to bid for it as well as the brand bidding on their own name will always bid the highest and gain top spot for it. Ted Baker probably have not done this since the web user searching ‘ted baker’ makes clear they want Ted Baker and no other brand. To take advantage of PPC – Organically, the number one spot on organic results will take the web user to the homepage of Ted baker. This is great. But, if Ted Baker wants the the web user to go to another section of the site other than the homepage, they will have to use PPC with site link extensions to achieve this like they have. What Ted Baker have done is advertise their brand further in the description and then gave web users the ease of use of finding a section of the website before even going onto the website with the site link extension. Basically, Ted Baker are trying to help the web user out by making it even more convenient to visit their website: this will inherit a good CTR. 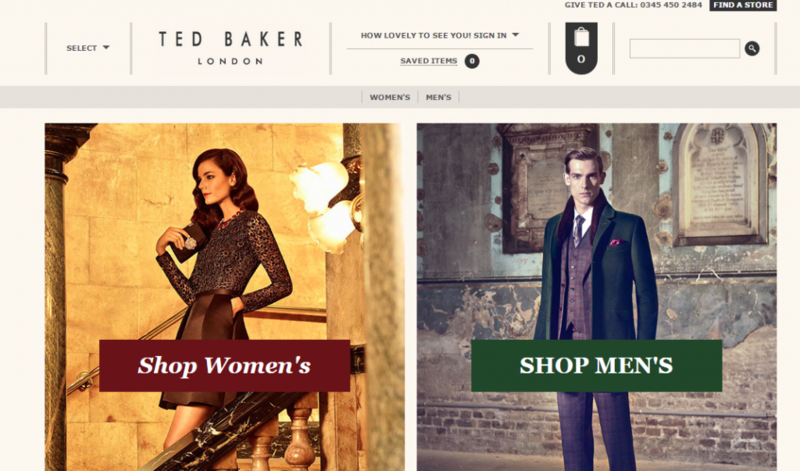 The landing page is another reason why Ted Baker included site links in the search advert: because the landing page is just a ‘middle man’ page in getting the web user to go to a specific area of Ted Baker’s website. 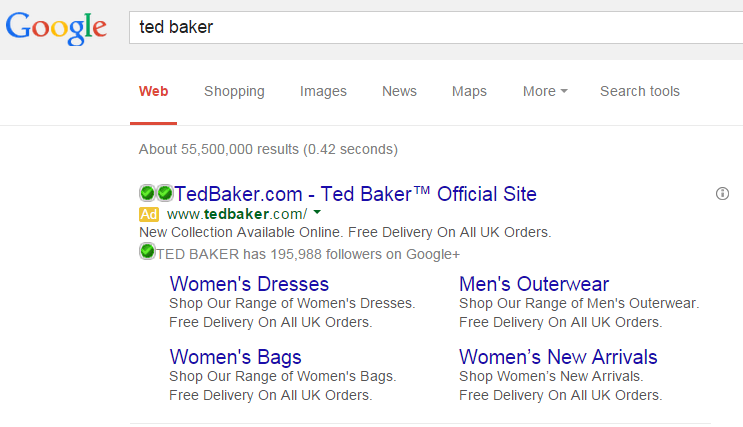 Therefore, ideally, Ted Baker wants the web user to click onto the site links from the search advert as if they click on the title of the advert, it will just take them to a landing page that basically has the same objective as the search advert: to get the web user to a specific area of the website to shop around. Looking at the landing page itself, it is well designed as a click through page since it has two large image links which makes clear Ted baker wants the web user to click on either one or the other. Although using the homepage as a landing page is frowned upon in PPC, Ted Baker can do this since their homepage is well optimised to be used in this PPC campaign.